The estate of William Faulkner is furious. In the past month it has filed two copyright infringement lawsuits, one against Sony Picture Classics and another against Northrop Grumman Corporation and the Washington Post Company. In the Sony case, the Faulkner Estate claims that Sony infringed Faulkner's copyright in the famous phrase from Requiem for a Nun, "The past is never dead. It's not even the past." when the lead character in Woody Allen's film, "Midnight in Paris." exclaims, "The past is not dead! Actually, it's not even past." 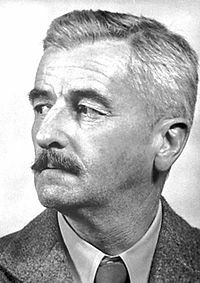 In the case of the suit against Grumman and the Washington Post, the Faulkner estate claims that it printed without the estate's permission, Faulkner's phrase, "We must be free not because we claim freedom, but because we practice it," in a full page advertisement paid for by Grumman. The offending quote was from Faulkner's essay, On Fear: the South in Labor. Defendants in both lawsuits will raise the "fair use" defense to blunt The Faulkner estate's attack. So let's take a brief look at the "fair use" doctrine. As a result, the law of fair use is one of the most vague and unpredictable areas of copyright law. Let's take a peek at the arguments that the lawyers will likely make in the Faulkner estate case against Sony. The Sony lawyers' principal argument will be that the amount and substantiality of the Faulkner quote is insignificant. The Faulkner estate lawyers, on the other hand, will argue that first, Midnight in Paris does not arguably fall within the statutory categories of criticism, news reporting, teaching, scholarship, or research and, second, despite the short length of the quote, Sony is using it for commercial purposes. The Sony lawyers, of course, scoff at the suggestion, asserting that use of the Faulkner quote will have absolutely no commercial impact upon the market value of the copyrighted work, which is more than 60 years old. See the article in CNN.com for a first-hand account of the war of words. The arguments raised by lawyers in the Grumman case will be similar. Should the cases actually go to trial, an unlikely scenario, copyright experts everywhere will be closely watching. I heard that some insanity has recently infected the Republican Study Committee, when it published a memo with the exciting title of "Three Myths About Copyright Law and Where To Start To Fix It". What gives? A young staffer at the RSC, Derek Khanna, wrote about our broken copyright law, and on a Friday a couple of weeks ago, the memo was published on an official website of the Republican leadership in the House of Representatives. His memo addressed three issues that the leadership felt needed to be "fixed": that copyright law is no longer promoting the creation of new works, but has become only about entitlement to payment; that copyright law promotes a free market for works, when, in fact, it is a government-sanctioned monopoly, enforced by fines that are larger than any value created; and that our copyright laws lead to the greatest productivity. As quickly as you can say, "the Emperor is naked" the large content lobby, principally the Motion Picture Association of America (MPAA) and the Recording Industry Association of America (RIAA) called their Congressmen and demanded that Mr. Khanna's memo be removed. By the very next day, it was gone from the website. But, as we all tell our kids, the Internet is forever. The memo had been downloaded and preserved for all to read. The questions asked by Mr. Khanna are really important ones. After all, the Constitution says that copyright is to last for "limited times" (US Const. Art I, Sec. 8, Cl. 8), and in the early days of the nation, that meant fourteen years, plus another fourteen if the author was still alive and filed for the renewal. In recent years, Congress has responded to the requests (often in the same envelope as campaign contributions) from the content industry by extending the "limited times" to the life of the author plus 70 years, or 95 years if the author is a corporation! The "Mickey Mouse Copyright Term Extension Act" added 20 years to all copyrights, retroactively, and some asked how this extension served the original purpose of copyright, but the Supreme Court decided that "limited times" means anything that Congress says that it means. Period. As you can see, there may be many things in our copyright law that should be fixed. Certainly Mr. Khanna thought so, but in our system, we often end up with the best Congress that money can buy. Sorry to be so cynical, M., but I am sure that our friends at the MPAA and RIAA would rather we continue to hunt down every single person who illegally downloads music and movies (not that the Doc condones such behavior) but that we never, ever, discuss why the penalty for doing so should be thousands of times the "damage" that such downloading causes. Mr. Khanna's conclusion, "Current copyright law does not merely distort some markets - rather it destroys entire markets" deserves careful debate. It's just unlikely that such debate will ever take place in Congress or the Courts. Hopefully the administration will appoint a replacement who also knows about patents and believes in the patent system. We've said it before, but it bears repeating. Remember that on or after March 16, 2013, you MUST protect your invention before offering the invention for sale or using the invention in public. Otherwise, you lose your U.S. patent rights instantly and forever. This is a major change in the law and requires an entirely new level of paranoia on the part of inventors and the companies that employ them. How can you protect yourself and your company? (1) Do not offer the invention or a product including the invention for sale until you file a patent application. (2) Do not use the invention in public until you file a patent application. (3) Do not disclose the invention to someone else unless you have filed a patent application or unless that person has signed a non-disclosure agreement. Disclosure of the invention by you does not immediately terminate your U.S. patent rights, but does immediately terminate foreign patent rights in most circumstances. PLEASE keep that above in mind and do not forfeit your rights by mistake. For more information, follow this link.